CEO Lei Jun to be one of the richest men in China after IPO that values business at US$100 billion. Xiaomi Corp has applied to sell shares in Hong Kong in what is expected to be the biggest initial public offering globally this year. Although Xiaomi didn’t provide financial terms in its IPO application to the Hong Kong Exchanges and Clearing, bankers and industry insiders said the company is seeking to raise US$10 billion through the IPO which values the eight-year Beijing-based company at US$100 billion. Its value will surpass those of Baidu and JD.com to become the third-biggest Chinese technology firm behind Tencent and Alibaba, they said. Xiaomi’s business now covers smartphones, mobile application stores and intelligent devices from routers and artificial intelligence speakers to air purifiers and wristbands. Despite its wide offering, 80 percent of business still comes from smartphone sales. But Xiaomi is an “smartphone, intelligent and IoT devices" rather than a smartphone vendor and has limited the margin of hardware products to five percent, said Lei Jun, chief executive and founder of Xiaomi. In 2017, Xiaomi generated a revenue of 114.6 billion yuan (US$18.2 billion) including one-third from overseas regions, a growth of 67 percent year on year. The company reported a net loss of 43.89 billion yuan last year. Excluding one-time charges, it said its profit was 5.36 billion yuan, according to the filing, which is the first time the company has reported financial details. Xiaomi also said it will cooperate with CK Hutchison Holdings, owned by billionaire Li Ka-shing, to establish a global strategic alliance today. The deal will allow Xiaomi's products to be sold in 17,700 CKH stores in Austria, Denmark, Ireland and Italy. 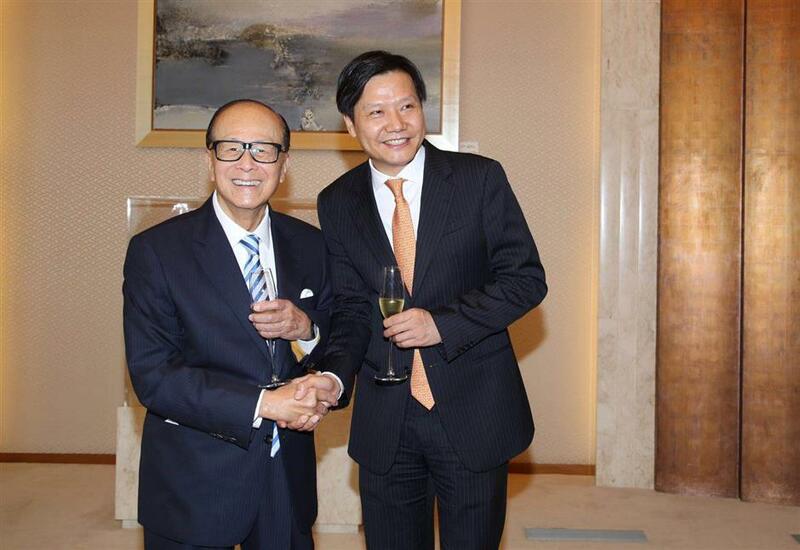 Lei Jun (right) shares a happy moment with Li Ka-shing today.